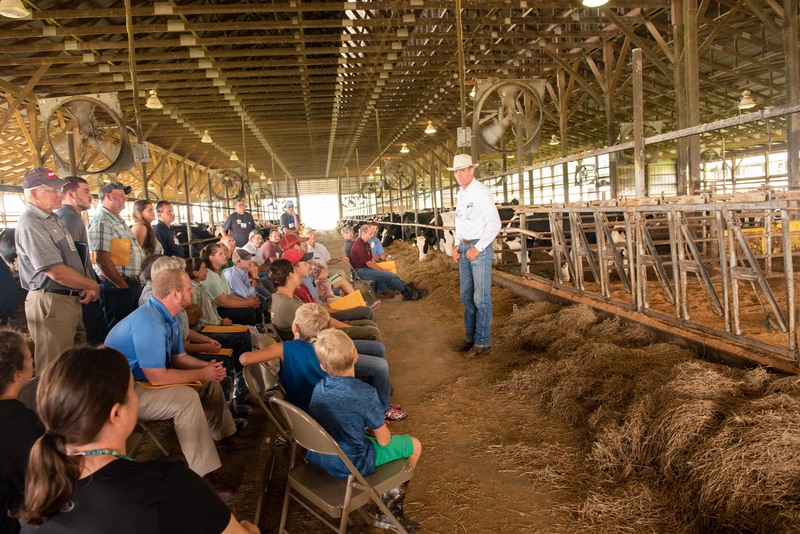 LOGANTON, Pa. — During the Professional Dairy Managers of Pennsylvania Summer Summit in August 2018, Curt Pate, known as ‘the cow whisperer’, brought back his cow-moving, handling, and stockmanship demonstration for an encore performance. Over 100 dairy producers attended the Summit, some with their employees. The host farm for the Summit was Schrack Farms, Loganton. Two years ago, Pate was featured at the 2016 Summer Summit, hosted that year by Dotterer’s Dairy, Mill Hall. For the past three years, PDMP has offered hands-on Summer Summit content that satisfies elements of Beef Quality Assurance and various dairy animal care program certifications. And yet, it’s not the cow that we’re working with, but really the brain of the cow, when it comes to getting the animal to decide to do something rather than forcing it to do something. Pate explained the “thinking” and “reacting” sides of the cow’s brain. “When an animal is on the thinking side of their brain, they’re content, not hot, have all feed they need, this life is good in here. So this is contentment,” he said, gesturing toward the cows behind him, assembled for the cow-handling demonstration. “Even though we’re all sitting in here, they’re not afraid, These animals are thinking about laying in their bed, going to the bunk, getting next to somebody they feel comfortable with,” he said. Pate explained the other side of the brain as the “survival” or “reaction” side of the brain. “Sometimes when the human steps in and puts on the wrong kind of pressure, we can switch the brain from growth to survival, which I call shrink, or cost,” he said, explaining that human intervention has a lot to do with this. Pate went on to emphasize that a stockman’s primary tool is his vision. As he moved through the cattle and focused on one, he noted: “It’s really hard to get much done in the front of the cow, to do much from the front. (When I’m) close to the front, I’m still in focus. “As I start to step back towards her tail, now you’ll see she starts turning her head to see me, and now she wants to see me with two eyes,” he demonstrated. “As I step into her, now watch her ears. As I get right behind her tail over here, she doesn’t like that at all, she doesn’t like me there. So the further I come forward, the more the cow likes me. Where can we be on that cow to create the right pressure so she can be comfortable and not aggravated at me and so I can move her to where I need her to go?” he quizzed the group. Pate noted that, “Noise can be helpful. Touch can be helpful as well. Talking to an animal or making rasping noises, those are okay. Describing three kinds of pressure, Pate demonstrated them. With driving pressure, he said, it’s better to work the cow from the ear, rather than from tail. The second type of pressure is drawing pressure, like using a bucket of grain to move a cow. “I can use this behavior of the animal wanting to see me with her two eyes as well to draw her in, move her,” said Pate. The third pressure Pate explained and demonstrated is maintaining pressure. Pate’s workshops are a highlight for dairymen and cattlemen. Cow handling workshops like this also provide employee training benefits that dairy farms will need in the newer updated versions of the F.A.R.M. program. The Pennsylvania Beef Council sponsored the cow whisperer’s workshop during the PDMP Summer Summit as it is also a qualifier for Beef Quality Assurance Certification, which shares many animal care and handling principles with F.A.R.M. Next Dreams do come true!